deploy them as a MOBILE FORMS APP! In Minutes with No Code! Each mobile form automatically generates a cloud database of all form submissions. That database is available for dashboard view, searching, exporting, integration, and is hosted in secure cloud database on either Azure or Amazon S3. FastField's proven cloud solution allows field service companies to meet complex and demanding needs without code or installed software. Delivering professional reports and populating data into company "standard forms" is a critical for many businesses. Using FastField's Word and PDF mapping allows forms and checklists of all types to be mapped into "required" forms. 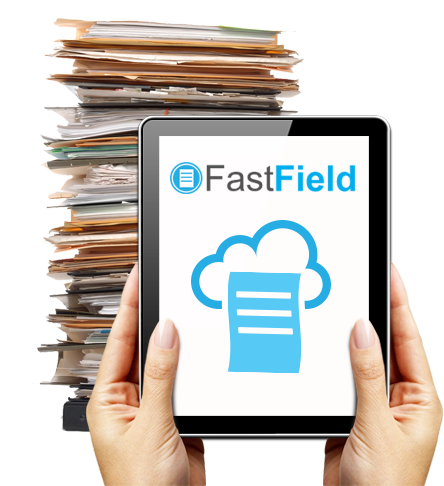 Collect data using FastField mobile forms and present the data using Word or PDF report templates. Modern businesses depend on systems, CRM, ERP, Tracking, Accounting, home grown, and SaaS services. API's, direct post, and Zapier integrations make moving data between systems quick and easy. Populate FastField with your client and system data for faster, more accurate data collection. Push FastField generated data back into your systems. Dispatch forms out to contractors and staff, track when they accept the assignment, and notify or re-assign jobs before due dates arrive. Keeping track of the work is progress helps companies manage field agents for on-time delivery. In addition to job tracking, each form can be routed to a different users for sign-off and multi-step or multi-day workflow. Reduce confusion and make it easy for employees and clients to know it is your system. White label the Apps and even the builder. Do you have clients that need mobile forms? Become a reseller under your branding. Would you like to speak to a person?